This list is rife with spoilers—if you’re not up-to-date, read at your own risk. Now into its sixth season, the only thing certain on AMC’s The Walking Dead is that nothing is ever certain. From the unceremonious deaths of lead characters to massive deviations from its source material, the show is as famous for its surprises as it is for its gore. And this anything-goes spirit has extended to viewers, who have a few wild ideas of their own. 1. A CERTAIN FAN FAVORITE IS STILL ALIVE. We’ve now had two full episodes since Nicholas—or Nicholas’s body—pulled Glenn off the dumpster into a crowd of walkers to his apparent death. And in those episodes, we have received no confirmation that the fan favorite character bit the dust. Because of this, fans are eager to cling to any and all evidence—be it a cryptic promise from showrunner Scott M. Gimple that “in some way, we will see Glenn, some version of Glenn, or parts of Glenn again” or a plea from Steven Yeun, the actor who plays Glenn, to watch the show for the story, not a character—that Glenn lives. But how? The most popular theory posits that Nicholas falls on top of Glenn, and it’s Nicholas’s intestines that become walker lunch. Covered in blood and guts, Glenn is able to remain undetected just long enough to roll under the dumpster to safety. 2. ENID IS A SPY. Cinema Blend lays out a convincing case for why Enid, the turtle-eating survivor who finds her way to Alexandria just months before Rick Grimes’s crew does, may be more than just a potential love interest for Carl. Using her propensity for sneaking beyond the community’s walls and her hesitance to approach Alexandria in the first place as evidence, the site hypothesizes that Enid is a spy. Whether she’s spying for the deranged Wolves or a yet-unseen enemy—perhaps the Saviors, a terrifying group important in Robert Kirkman’s graphic novels—is the subject of debate. 3. RICK IS IMMUNE/IS A ZOMBIE ALREADY/IS IMMORTAL. The popular “Rick is already a zombie” theory originated when Redditors started hypothesizing how our hero could have survived in the hospital for months without food or water as the world fell to ruins around him. The only plausible explanation, many have decided, is that Rick didn’t survive at all—he actually died in the show’s very first episode. When he wakes up and leaves the hospital, Rick is not emerging from his coma, but is rising from the dead. This is where things get tricky: If the virus is already present in everyone, as we learn at the CDC at the end of season one, why doesn’t Rick reanimate as a zombie? Theories diverge here. Some believe that Rick has the disease like everyone else does, but it’s dormant in him. The dormancy keeps him safe from the virus’s worst symptoms (namely, becoming a flesh-eating monster), but he will continue to come back to life each time he’s killed. Others believe that Rick’s coma is to thank for his non-zombieness: The disease couldn’t attack his brain the way it normally does because his brain activity was reduced during the coma. Donna Dickens at HitFix makes a case for why this is all baloney: While Rick was indeed in a coma for months, she theorizes, the hospital had only recently fallen. Until just days before Rick awakens, a generator had been powering the hospital and doctors had been tending to patients. 4. IT’S ALL A DREAM. 5. THE ZOMBIE VIRUS WAS STARTED BY ALIENS. Crazy, right? Or just crazy enough to be true? The fact that the zombie virus affects humans alone and doesn’t appear to be spread by animals has led some Redditors to conclude that it must be the work of extraterrestrial beings bent on destroying the human race. The virus will eliminate all human life, but leave the rest of the world largely intact and vulnerable to alien colonization. 6. NORTH AMERICA IS A QUARANTINE ZONE. Commenters counter the alien theory with a more plausible one: The zombie virus is an example of biological warfare gone astray. The virus was developed as an experimental weapon that somehow (either mistakenly or purposefully) was unleashed on the United States. The show’s myopic perspective keeps viewers in the dark about the fate of the rest of the world. It’s therefore possible—improbable, but possible—that the virus never crossed the Atlantic, and North America was cordoned off in order to keep the rest of the world safe. As far-fetched as this may be, ending the series by zooming out to show the rest of the world continuing on as normal would be mind-blowing. 7. THE ZOMBIES WILL SOON COMPLETELY DECOMPOSE. Greg Nicotero and one of his creations. 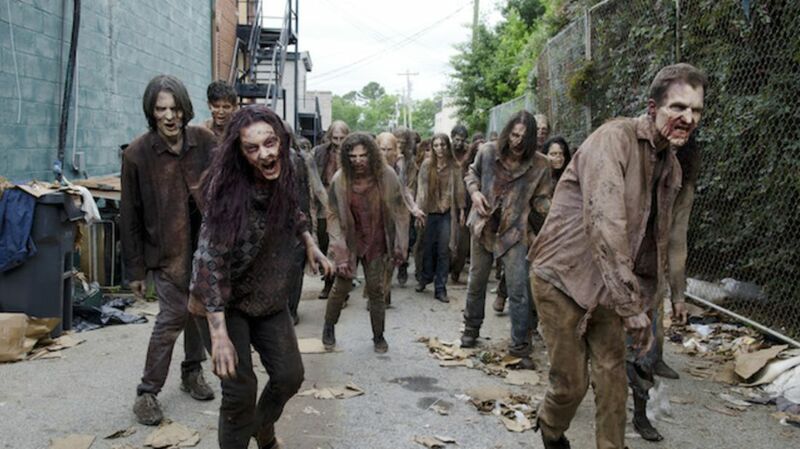 One optimistic theory posits that the best way for the human race to combat the walkers is to hunker down and wait. Entertainment Wise uses the fact that executive producer and SFX makeup supervisor Greg Nicotero makes the zombies look increasingly decomposed each season to support the hypothesis that, given time, the zombies will completely decay. Unburied bodies take approximately one to three years to turn to dust, so if everyone just hid until then—thereby preventing the walkers from claiming new victims—they’d all be in the clear. 8. THE MAIN CHARACTERS ARE HEARING-IMPAIRED. 9. THE SHOW’S PROGRESSION MIRRORS THE HISTORY OF WESTERN CIVILIZATION. As one Redditor sees it, the show is a commentary on human progression. Hershel’s farm, which our gang reaches in the second season, represents the invention of agriculture and the end to a hunter-gatherer lifestyle. Woodbury—ruled by the all-powerful Governor, replete with gladiator games—is a stand-in for the Roman Empire. The epidemic at the prison mimics the Black Death, and so on. 10. NEW BABIES ARE DISEASE-FREE. One fan camp hypothesizes that babies born after the initial outbreak do not have the zombie virus inside them. If Judith were to die, therefore, she would not reanimate as a zombie. Fans like this theory because it offers a glimmer of hope that things could someday return to normal, and also that love (and reproduction) might be what saves the world. All images courtesy of AMC.